It’s a staggered sidewall belt that’s unlike anything you’ve seen before. The new staggered sidewall belt for Dorner’s AquaPruf VBT Conveyor features Vertical Belt Technology, which makes it easier to clean and sanitize, provides greater pocket capacity, and also requires less maintenance than a traditional bucket elevator. Dorner spent more than a year developing the staggered sidewall belt with its belt manufacturing partner. Focusing its efforts into developing the belt first, Dorner engineered the rest of the conveyor around the belt; the result is a new sanitary conveyor with a complete redesign of the industry-standard pleated sidewall belts commonly used for vertical lift conveying applications. The belt itself is made from a FDA-approved and USDA-certified food safe urethane belt material, making it ideal for elevating bulk products in 90° sanitary applications, such as: vegetables, fruits/grains/nuts, popcorn, pet food, pharmaceuticals and others. Additionally, the belt provides 15 percent more pocket capacity and improved product release than traditional sidewall belt designs. Both the pockets and staggered sidewall cleats are RF welded for heavy-duty bond strength. Each sidewall cleat offers 80 percent less bond area compared to a traditional sidewall belt. This helps to reduce failure points and lowers both cleaning time and water usage. 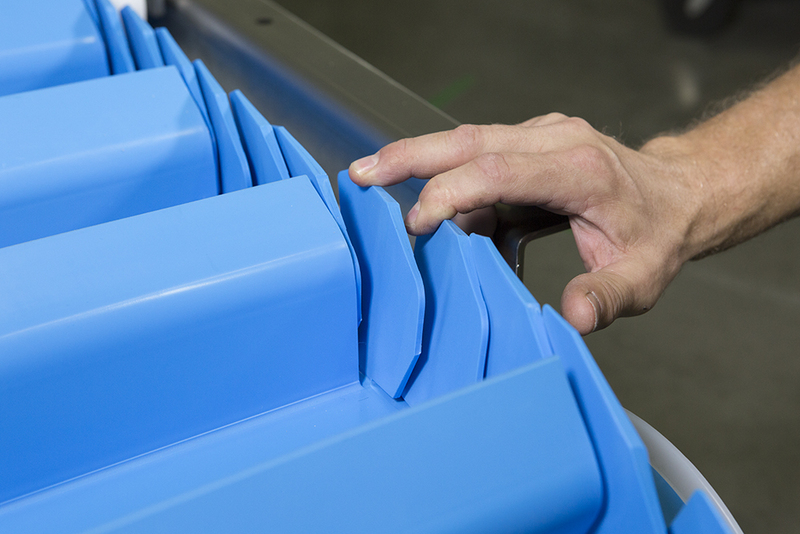 And, unlike belts used on traditional sidewall belt conveyors, which must be entirely replaced if damaged, staggered sidewalls can be independently replaced using a simple heat iron in a matter of minutes – on site, at the facility. For more information on Dorner’s staggered sidewall belt and the AquaPruf VBT Conveyor, visit the VBT Product Page.